For a change, we were blessed with some nice weather to start the day. There were bright blue skies and lots of sunshine - at least for the morning. We were able to get up, have a shower and get set for the day fairly quickly, so that we could just hook up the truck and go when we were ready. 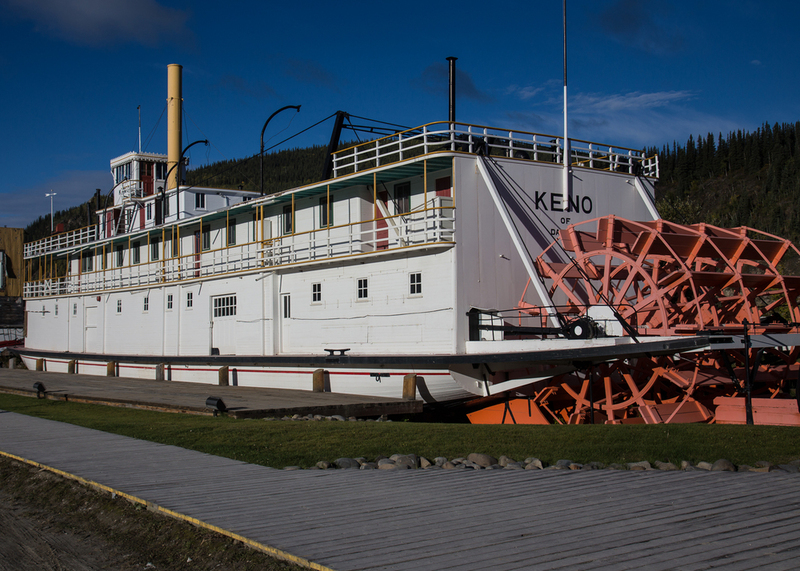 The Keno, one of the original paddlewheelers that worked the Yukon River in the gold rush days. We started out the day at a reasonable time, which gave us a few hours to check out Dawson City. It's a pretty cool place, with the dirt streets through downtown, the boardwalk sidewalks and the original facades on the buildings. It feels like a turn of the century town. 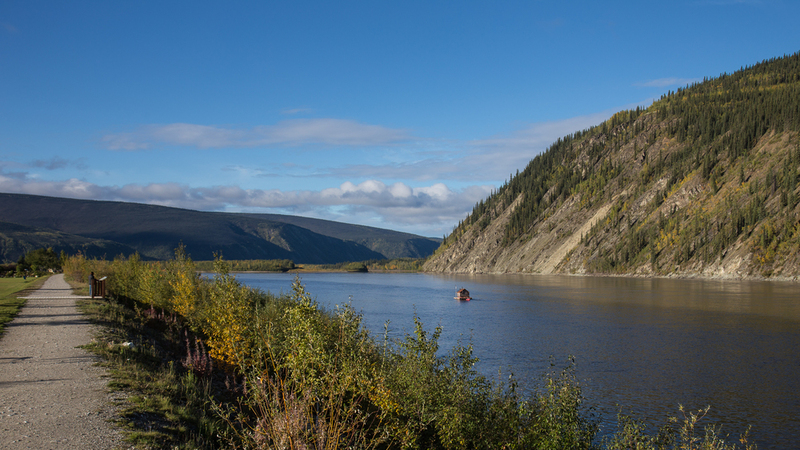 Dawson City is a beautiful place - especially in the nice morning light! Some of the great facades on the buildings in Downtown Dawson City. Visible from miles away, the brightly coloured facades on the original rooming houses. How do you not love a bright pink hotel? The Bunk House - one of the hotels in town. Justine had picked up a self-guided walking tour of the town, and she led us for about an hour long tour around the small downtown, to look at the various old buildings. Part of the tour took us along the waterfront, where we got a look at some of the old paddle wheelers that used to work the river. I really like the dirt streets - it adds to the authentic feel, although I imagine it more about the maintenance of asphalt with permafrost. One of the most interesting aspects of the tour were the few buildings that clearly show how difficult building on permafrost really is. While no longer occupied, some really do show the effects. Dawson City was the capital of the Yukon until 1952. 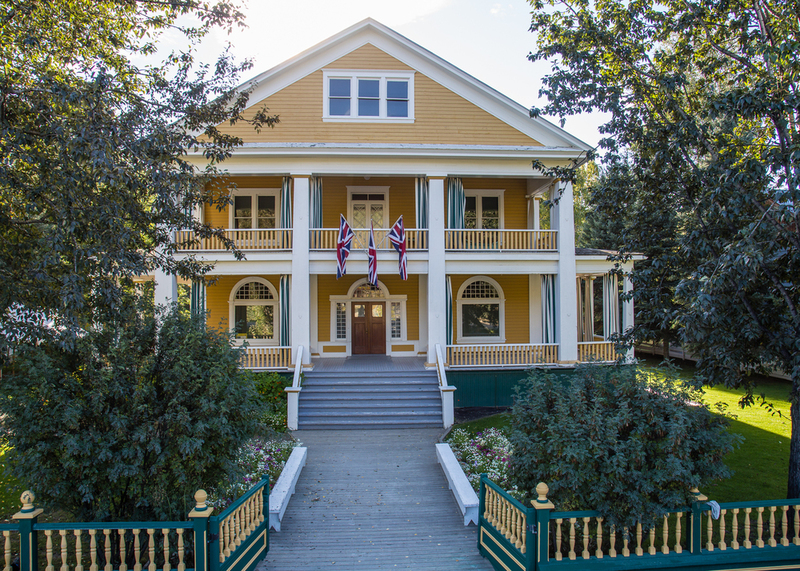 This was the seat of Parliament, and is now the Dawson City Museum. It's a pretty cool little place. We did that, did some shopping, then headed out of town. I would have liked to have had longer to explore Dawson City. More of the amazing scenery as we headed up the Dempster Highway. We had a short drive today - about two hours - north and east from Dawson City. 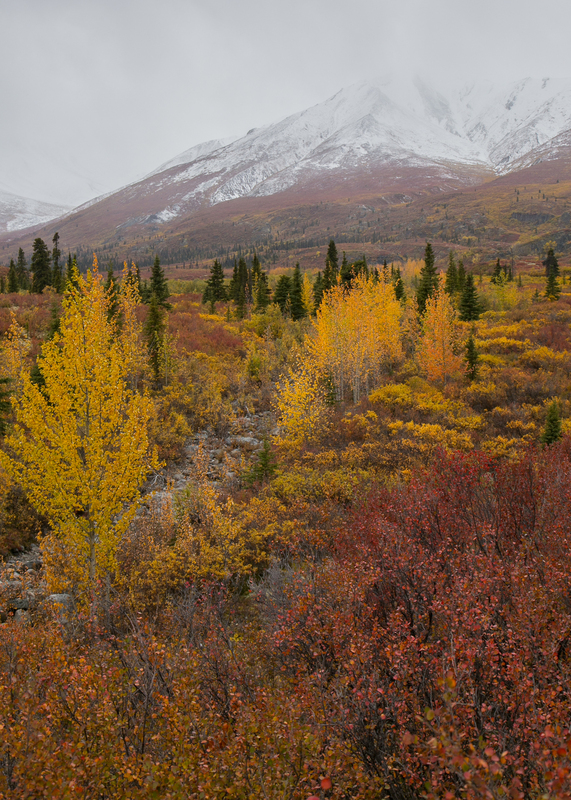 We were heading up the Dempster Highway to Tombstone Territorial Park, our destination for the next two nights. If we were to make it all the way t the Arctic Circle, we would have to go past Eagle Lodge, the only fuel between the start of the Dempster and Inuvik. 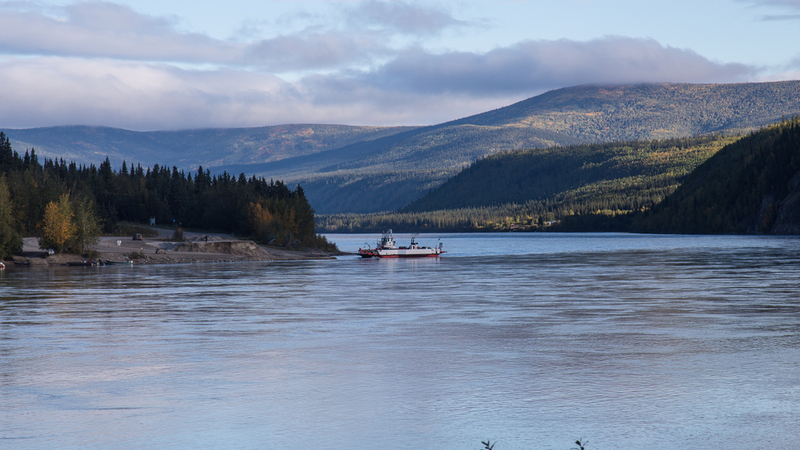 The Dempster was also to be our gateway to the far north, and our day trip to the Arctic Circle, that we had planned for tomorrow. 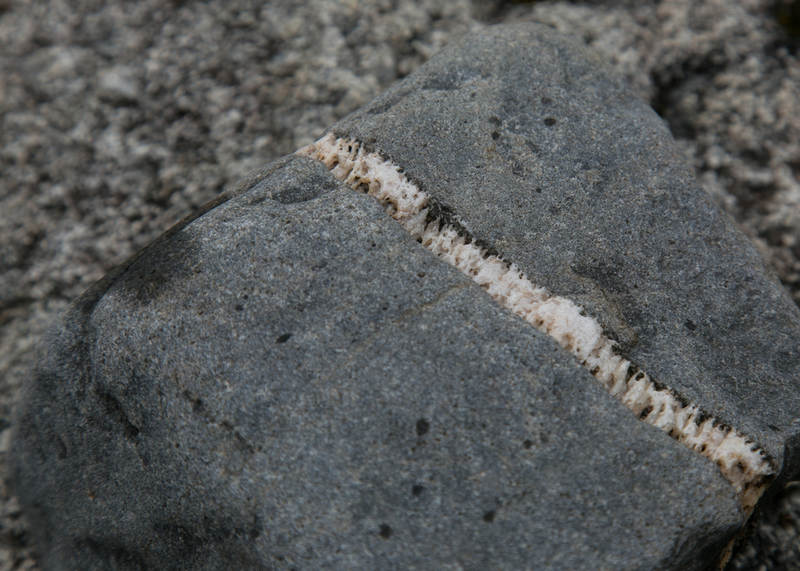 While in Dawson City we had heard some unpleasant things about the state of the road, given the weather over the last few days. They had received a lot of snow, and we had some concerns about how the drive would be. We decided to see how things went, and decide while we drove. But that was for tomorrow. 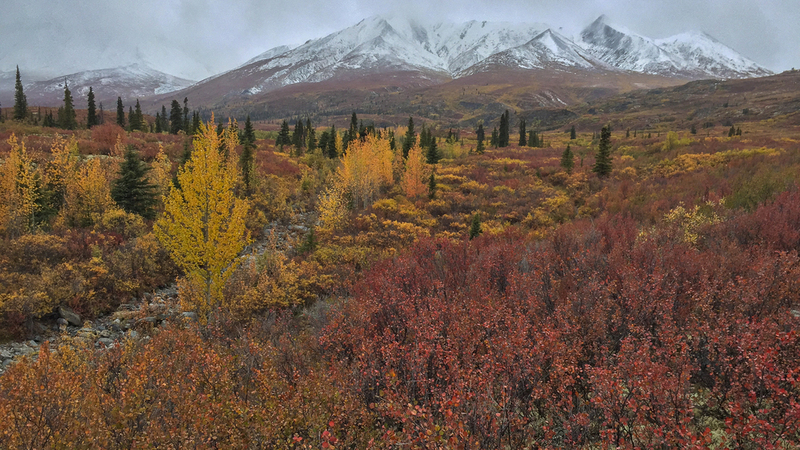 For today, we were going to enjoy Tombstone Territorial Park, and the glory of the fall colours on the tundra. It was pretty nice when we left Dawson City - about 9 degrees - but had already fallen to zero, and was snowing by the time we had made our way the 70 km north on the gravel road that is the Dempster Highway to the park. The driving was good - the road was in great shape and it seemed positive for our day heading further north. Along the way, the weather kept changing - clouds at time, snow, some peeks at the sun - so it was hard to appreciate the scenery. Still, we could tell it must be pretty spectacular. Every once in a while, a mountain would come into view, and we'd get a great look at the colour. Lot;s of golds and reds. The clouds lifted a little bit, to show us some of the mountains. This beautiful little river flowed right behind our campsite. 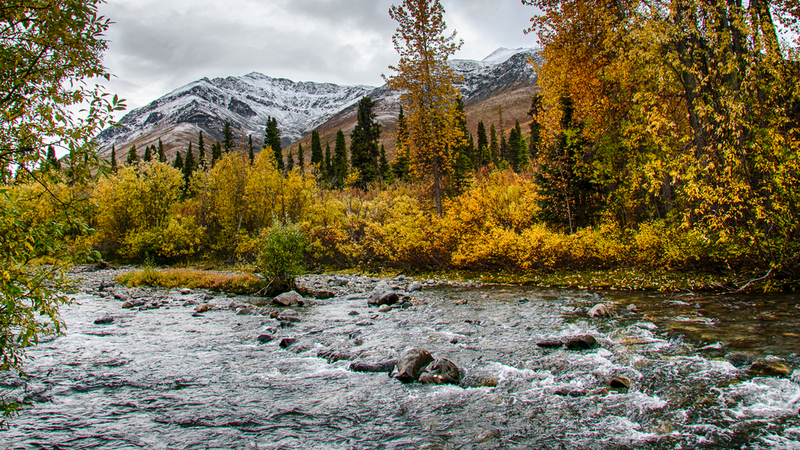 We grabbed a couple of great campsites right along this small river, and got camp set-up. Uncle Dave was set-up right next to us, and might have snagged the better site of the two, with the river being a little closer to the actual site. Justine and I grabbed firewood (which is free in the Yukon government campgrounds) and got prepared for the evening. Judging by the temperature, we were going to need a lot of wood for the campfire tonight! Justine getting our firewood prepared for the evening's fire. After getting organized, we did a short walk to the Tombstone Interpretive Centre. There was a nice little trail that started in the campground, pretty much right next to Dave and Linda's site. The trail would through the woods, and offered up amazing views of the local mountains - when the clouds parted enough for us to see them. The Visitor Centre was well worth the stop. It was nice and warm for starters, with a wood stove keeping the place toasty. They were brewing tea with local ingredients on it for anyone that wanted it. They had a number of great displays setup that gave great insight into the local terrain, the history and the wildlife that we were hoping to see. The raised deck provided some great views over the surrounding mountains. I think everyone took something different out of the displays at the Visitor Centre. There was a lot to take in, and it was all really well done. If you are ever in that part of the world, the drive up to the Tombstone Mountain Park and the Visitor Centre is a must do. View from the Tombstone Mountain Visitor Centre. We walked back to the campsite and made some lunch, and then headed out for a short hike. 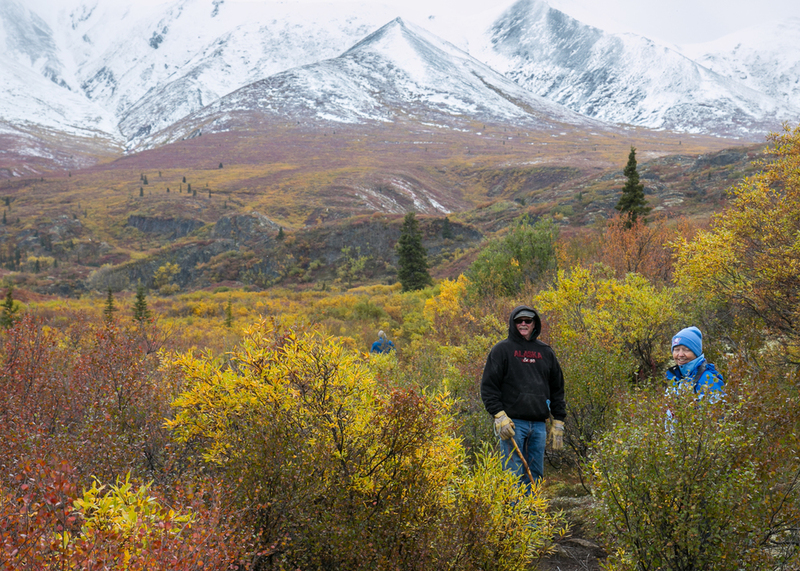 The North Klondike Trail is a short 2 km trail out onto the floodplain through some amazing scenery. It started out right in the campground, and looked like it would be the perfect distance for us, for what was left of the afternoon light. There were lots of warning about animals on the trails, but sadly we did not see anything while we were out walking. As we headed out, the snow started to come down. The snow came in and out, throughout our hike. At times, you could the wave of it come rolling down the mountain side. I would have preferred a bright blue sky, but this was pretty amazing, and definitely added to the atmosphere on the hike. Fortunately it never got that bad, and we were never at risk with losing complete visibility. It was a reminder how quickly the weather can change in that part of the world. The start of our hike on the Klondike Trail. The trail followed the river for much of the hike. 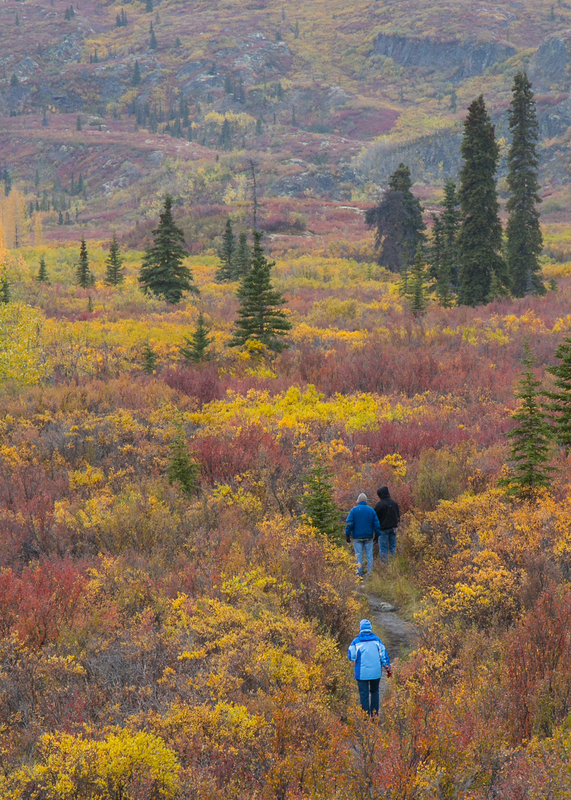 The fall colours were pretty amazing. The intrepid explorers heading for the mountains. Justine, out on our hike. At times you could see the snow racing down from the mountains. They had built out some boardwalks in places, to make the going easier. A rare pic with me in it! Such a lovely afternoon! ...but the views made it all worth while. The hike wasn't that long, and was an out-and-back that mirrored the river for stretches. The weather changed about a dozen times over the brief time we were out. At times we had amazing views of the mountains and the scenery; others the snow came down pretty hard. Regardless, the hike was breathtaking, and had given us the views of the tundra that we had wanted to see. The colour was amazing, the snow added to it (I still would have liked the clear blue skies) and it made for a cool hike. And I think, some good photos. You can let me know what you think. Panoramic view from the hike. After our hike we built up a nice roaring fire. We had some drinks, and got warmed up. Dad made us some dinner, and then we went back out to the fire and roasted marshmallows and made s'mores. Then it was off to bed ahead of a huge day tomorrow. The start of the perfect end to a pretty amazing day.